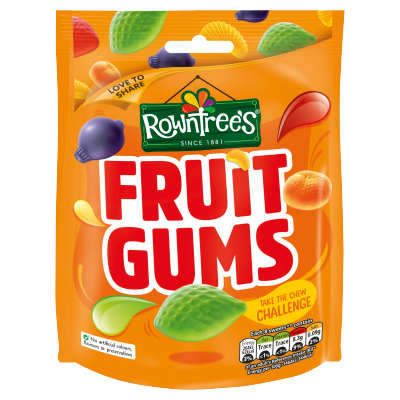 Rated 5 out of 5 by LoobyLou from Family favourite All of the family love Rowntree products. These are a firm favourite from many years ago and we still enjoy them now! The fruitiness is unbelievable! Rated 1 out of 5 by upset from TERRIBLE! NO PURPLES!!!!!! There were no purple sweets in my fruit gum package! This is false advertising. Rated 2 out of 5 by Woogie from No no no no NO! First off, are these suppose to be hard. 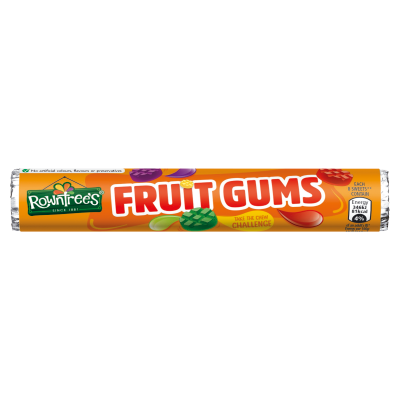 Second, they are very sticky and chewy and got stuck in my teeth. Not a fan of the flavor. Rated 3 out of 5 by Flash from Great sweets , poor selection of flavours I buy fruit gum the6bate my favourites , butbthevladt 3 packers have had at least 65% black ones which then means new don’t get many of the other flavours , such a shame , Can this be rectified ?? Rated 1 out of 5 by Annam from Smaller packet I bought the new sugar reduced sweets which strangely taste sweater than the normal ones. They are a bit too sweet. In addition, I noticed that the 150g normal packet has been reduced to 110g.